It is now being vigorously alleged that spring has arrived. Whatever, it’s still very cold. So the heat mat needed to be switched on to speed up the germination of new coleus seeds—the go-to plant in these parts if you want to discombobulate the local woodchucks who appear not to know what to make of these gorgeously resilient things. The seeds were started in a small cell pack, just small enough to fit in the Precious Plant Unit where only the most special plants are housed, receiving 14 hours of gentle light from two 17-watt T5HO bulbs. The mat is underneath the small pots and was off for most of the winter. A couple of A. obesum seedlings had to be kicked out, having beautifully recovered from root pruning earlier on. 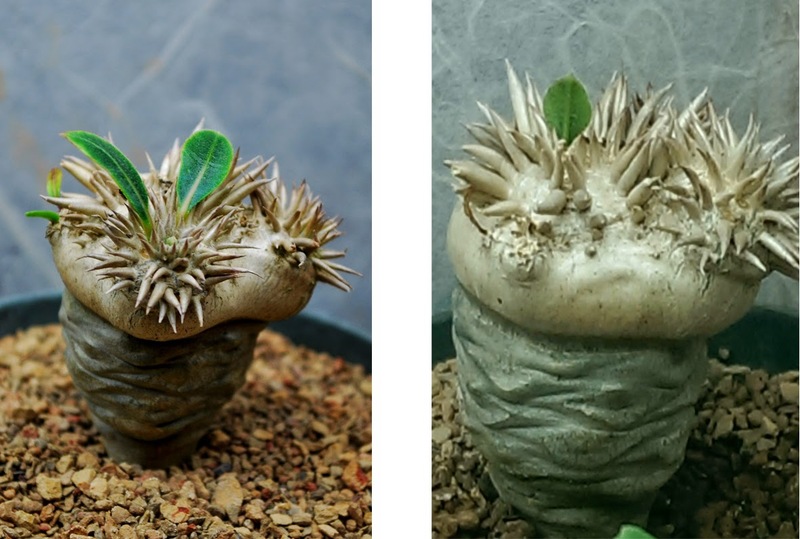 In this PPU, however, is the most precious in the not-so-impressive collection: a Pachypodium brevicaule seedling. Getting this plant was a mistake, of course; it is notoriously difficult to grow. It arrived sometime last November, grafted on to a Pachypodium lamerei base. 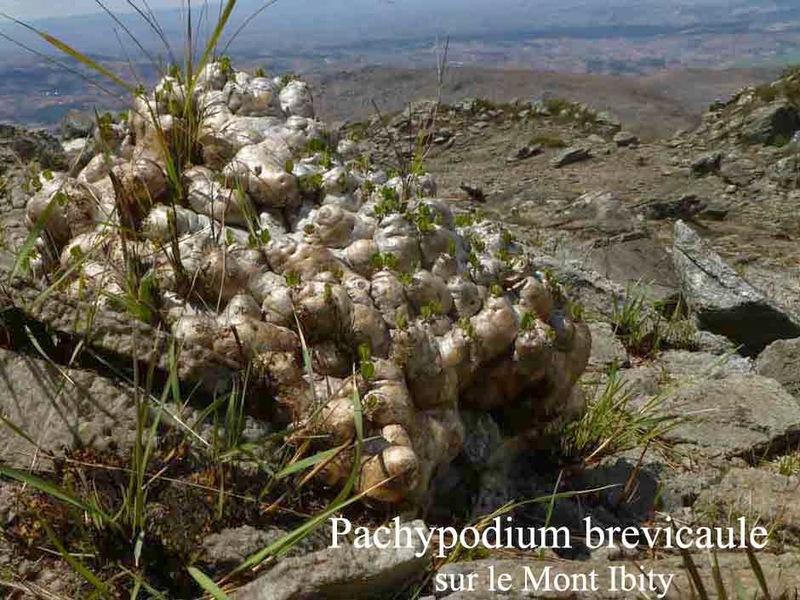 It is apparently the only way to make it easier to care for the P. brevicaule because it is otherwise a nitpicky plant that is extremely prone to rot when overwatered and to root-death when underwatered. Throughout winter, the plant sat back quietly, with one taciturn leaf meant to remind you that it is not a crown-of-thorns starfish, but a plant. It looked fine (not dying) at 20C, surrounded by other precious plants that seemed to thrive around it—two Dorstenia lavrani seedlings, three Dorstenia foetida seedlings and various A. obesum seedlings that were cycled in and out of the unit to get some light. Right: shortly after arrival, this P. brevicaule seedling dropped all its leaves, growing only one new leaf throughout winter (left). Watering is very tricky--judging mostly by weight. If the pot feels light, it gets some water. Then, the mat was switched on. The soil temperature in the unit rose to 30C. Within a week, as expected, the coleus seedlings were out and flourishing. But the dorstenia seedlings were struggling visibly and the tiny D. foetidas had to be moved out because they were drying too fast. The two D. lavrani seedlings had to be repotted (their roots were filling up the nursery pots anyway) and it remains to be seen whether they would have to removed from the unit as well. Obviously, switch off the heat mat, idiot, right? Well, yes, that would be the obvious solution. Except for the most precious P. brevicaule. It went to space! It happened so fast there wasn’t enough time to take transition pictures. WTF. In the time it took for coleus seeds to germinate, the amazing P. brevicaule went skyrocketing from one leaf into this. Growth is still on-going. it wasn't obvious before but now the tiny hairs on the leaves are visible. This is slightly confusing since both P. lamerei and P. brevicaule come from Madagascar where temperatures range from an average of 18C to an average of 25C. The island goes through a hot rainy season from November to April and then things cool down during the dry season from May to October. But I don't know enough about the microclimates on the island to even guess why this plant went suddenly hysterical sitting on a heat mat. It is possible it will bake and keel over in a few weeks or months. Although using the available information as a rule of thumb, it is probably wise to switch the mat off in May where ambient temperature in the 46th parallel climbs to a decent, liveable level. Supposedly, this magnificent plant will eventually engulf its P. lamerei base although it is a safe bet that this is largely anecdotal--it is doubtful that anyone has successfully grown a grafted plant long enough to witness this phenomenon. The grafting technique is relatively new and although grafted specimens grow faster than plants grown from seeds, it still grows only slightly faster than the vertical growth rate of the Himalayas. The only images that can be found online looked more like alien lollipops with the hulking P. brevicaule balanced precariously on top of a slender P. lamerei base. In cultivation, though, growers in the Garden Hivemind apparently keep it cold during the winter down to about 10C and "wake" them up in the spring with warmer temperature. It is reasonable to suspect this is what happened to this precious--it was jolted awake by the heat mat. Based on the experience of other growers, this plant will probably not bloom yet. Other than the fact that it is very young, it had not been cold enough during the winter and was leafless for only about a couple of months. Or maybe that's enough, who knows. The thing to watch for now is to not allow it to bake in the heat. In the meantime, continue to stare at this awe-inspiring vegetable. One thing to keep in mind is that most Pachypodium species are listed under Appendix I and II of the Convention on International Trade in Endangered Species of Wild Fauna and Flora (CITES). The P. brevicaule and P. lamerei, specifically, are listed under Appendix II. This means they are not necessarily threatened with extinction but their situation in their natural habitat is such that their collection and trade has to be strictly restricted to avoid threatening their survival in the wild. You can not just go flying to Madagascar to grab a blob that you will then plop into one of your pots, even if you can afford to do so. If you find a seller bragging that their specimen is genuine and collected from the wild, they better not have stolen and smuggled that into whatever country you are buying it from. This means that if you must own one, look for a reputable seller who is wise enough to grow specimens from its own seed stock. Such sellers exist in the not-so-wild.